Zapotec wool rug (2.5x5), "Dunes"
Pale ochre and deep brown evoke sand dunes along Oaxaca's Pacific coast. Natural dyes provide Delfina Ruiz with a fascinating spectrum of shades and hues, as she weaves a beautiful accent rug on a traditional handloom. 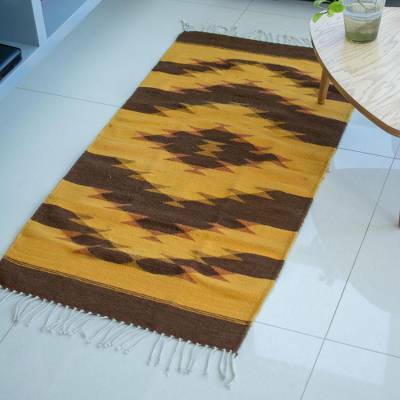 You can find zapotec wool rug 'Dunes' (2.5x5) by Delfina Ruiz in area rugs categories such as Zapotec Area Rugs, Nature Area Rugs and Wool Area Rugs. Enjoy exploring these sections for other Novica treasures.